Kevin started out as a trainee at Watford, but failed to make the grade and signed for Stockport County in the summer of1994. His opportunities were limited there, and he arrived at Nene Park in April 1995 on loan as Diamonds faced a backlog of fixtures. Rather oddly, the striker made two appearances – both in the full back position. 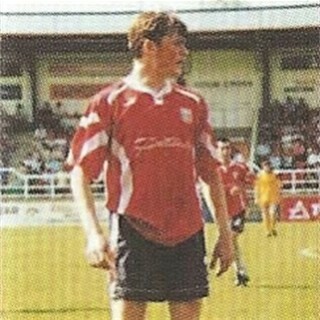 After his release by Stockport at the end of the season, manager Roger Ashby decided against bringing him back, and he joined Corby Town. His career in the lower leagues saw him play for Cogenhoe United, Raunds Town, Boston United, Raunds Town (again), Bedford Town, St.Albans City, Stamford, Grantham Town, Brackley Town, Rugby Town. In his time at Raunds Town in 1999, he scored some 33 goals in the season, while he scored 30 goals for Bedford Town in 2002 under manager Roger Ashby. In the 2006/2007 season, he was playing for Wellingborough Town, before moving on to Long Buckby, Northampton Spencer and Daventry Town in the 2008 / 2009 season. On 19 June 2009, he was appointed player/assistant manager to another former Diamond, Andy Peaks at Northampton Spencer of the United Counties League Premier Division. Kevin left in 2012, and signed up for UCL side Sileby Rangers in July 2012. After a brief spell there he retired from the game.